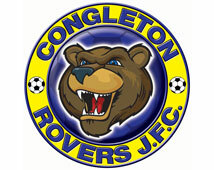 Congleton Rovers FC is an FA Charter Standard Community Club based at Congleton High School. We run teams from U7s to U18s who play in the Mid-Cheshire Youth Football League and the U21s who play in the NW U21 Development League. We are an FA Wildcats Centre for girls football and run an U9s girls team playing in the Cheshire Girls League at Moss Farm Northwich. We have an association with an adult team, Congleton VR, who play their home games at Congleton Town FC and Congleton VR VETS, who play at CHS. We enter the League Cup, the Mid-Cheshire District FA Cup and the Cheshire County Cup competitions. Finally at the end of the season, teams often enter various summer tournaments. Our philosophy is to be competitive without trying to 'win at all costs' - especially in the early years. Ideally we aim to build-up players individual footballs skills and encourage teamwork. As players and teams develop into their mid-teen years the emphasis inevitably shifts towards winning and in theory the early 'groundwork', combined with their increased knowledge of the game should translate into results. Our younger teams, U7s to U10s, play mini-soccer. The U7 & U8 ages play 5v5 and U9 & U10 play 7v7. The U11 & U12s play a 9v9 format and then at U13s 11v11 when scores are able to be made public. In order to join one of our teams, contact the relevant team officials for more information. If you wish to become involved with the club as an official, please contact the club Secretary or Chairman. New teams are formed at the beginning of summer - in particular the early age groups. For enquiries regarding new teams, contact the club Secretary.